Come float down the river! The Inflatable Regatta will be on again in February 2018 and you can get your tickets now. Despite its name, the Inflatable Regatta is not a race, it is a chance to peacefully float down the Yarra River starting from Yarra Bank Reserve and finishing downstream in Hawthorn. The course is two kilometres and at a relaxed pace, it'll take between one and two hours. This is dependent on the tide as the Yarra is a tidal river. You don't have to worry about falling in–it's pretty hard to do. But in case you do there are rescue boats and people to help you out. When you get out of your boat at the end someone is there to help as well. There will be a party at the end as well as music along the way. Starting times are staggered to ensure not too many boats start at the same time. This year the number of boats will be capped at 1500. 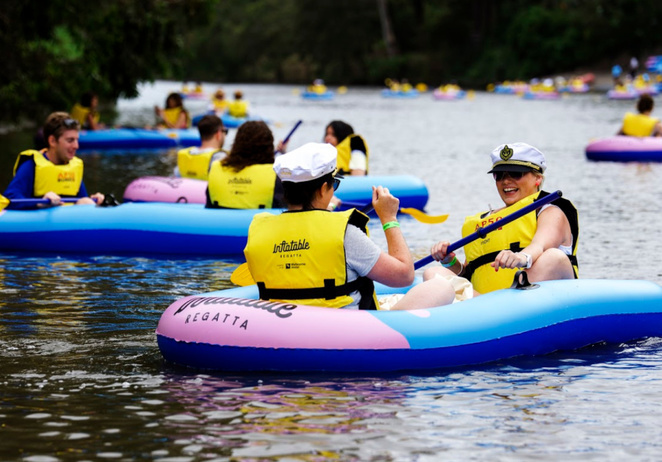 Safety and well-being of participants are paramount to the event organisers and together with Melbourne Water and Parks Victoria and many volunteers on the day they will ensure everything runs smoothly and safely on the day, At the end of the event boats left behind will be looked after and put to good use so there will be no environmental impact. Or you can keep your boat and oars for an extra $10. Also, in light of being environmentally responsible the event will be plastic water bottle free! Bring a reusable bottle and fill up at the water cart. So get a ticket, arrive light, get kitted out and coast down to a party at the end (and some musical bonuses along the way!). Check out the website for more information about the day and F&Qs that will answer many of your questions. There is a strong emphasis on safety and if you've celebrated your 12 year birthday you can participate. Under 18s must be in a double boat with an adult though. Hi, we've had to change the date!